If there’s a marketing need in residential real estate, there’s a company that will provide it. This vast, wide-open market mentality has quite a bit of good, but much more bad. It’s just the nature of business. 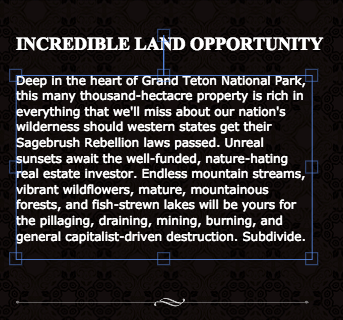 I’ve seen some exceptional real estate company websites. And some have left me missing hit counters, AOL and the gurgling static buzz of dial-up modems. The same goes with marketing collateral production tools. I know a lot of CRMs, enterprise marketing platforms and even website providers enable you to create and print listing and open house promotions, or postcards and even full-color, multipage brochures. As I always say though, technology that aims to do one thing well always tends to be the best at that one thing. I started designing on the computer in college, using Adobe PageMaker 1.0. Remember it? I also learned Photoshop 1.0 while I had access to a scanner, color laser printer and a less-than-attentive art department supervisor. Anyway, it’s amazing what the Internet affords us today. 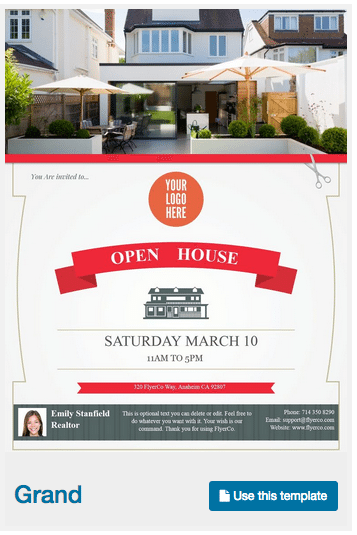 FlyerCo is Web-based software that makes real estate collateral for listings, open houses and direct mail campaigns. That’s pretty much it — and it’s pretty great. Visually speaking, you can’t go off the reservation with a real estate flier because the property data needs to take precedence. It needs to be presented it in a way that attracts eye contact to each parcel of property information. FlyerCo’s designs do exactly that — they’re fresh and Web-ready. Even in instances of white space, they don’t feel empty. Well done. There are more than enough template designs for listing brochures. Currently, the postcard and open house choices are rather limited, but I was informed that many more are on the way as the company continues to grow. Building fliers is very easy; I created one in only a few minutes with no prior copy or content ready to go. I went in blind and had zero learning curve. To edit the starter sample text, just click on the copy block on the flier to reveal the edit menu on the side of your browser. 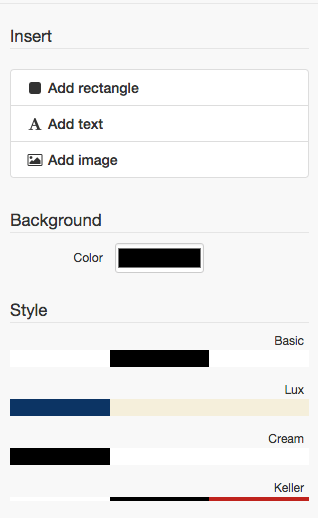 Simply type your descriptions and features, choose a font, color, size and move on. Text boxes actually work quite similarly to more advanced page layout software. Click on a block of copy and a dynamic frame appears that can be pulled, pushed and stretched to accommodate your type volume. The text reacts to however you adjust it. 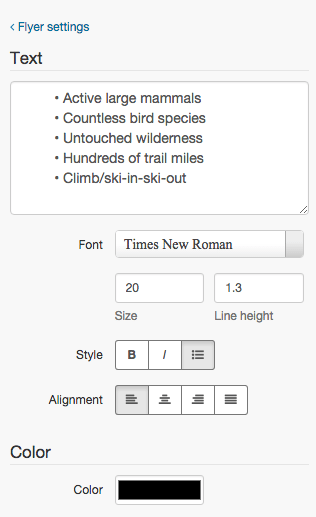 You can also just drag the text box to another spot on the page. Property imagery can be uploaded quickly from your local drives to the FlyerCo library. These interfaces are bold and simple to interact with, requiring no advanced technical knowledge. You do more work to post to Facebook. Images can be nudged around in their frames by a pop-up menu of arrows. And if you really screw up something, FlyerCo has a multistep undo feature. And a redo. Speaking of which, your FlyerCo project can be quickly sent to a number of social media profiles for instant promotion. Or, just email or copy the link. I like that upon initial account creation, FlyerCo asks you for your basic contact information and a headshot. Each flier you create will automatically embed this contact data so you don’t have to recreate it every time. It’s a nice touch of efficiency. Another very thoughtful and highly beneficial feature is FlyerCo’s auto-alignment guides. Grab a text box or picture and green border lines flash on screen, allowing you to put adjacent graphics on the same vertical or horizontal planes. True graphic designers work on a grid, carefully positioning visual elements on a page in such a way as to provide balance and organization of information. What may look like the random placement of stuff in a layout is often calculated and very deliberate. If you were to watch a true designer at work, using this grid, an entirely new appreciation for the skill of graphic designs would emerge. Administratively, from creating an account to starting my first flier, the process took no more than three minutes — if that. All of your fliers are listed for you upon login, and if you like a particular design, just duplicate it and insert the appropriate information. 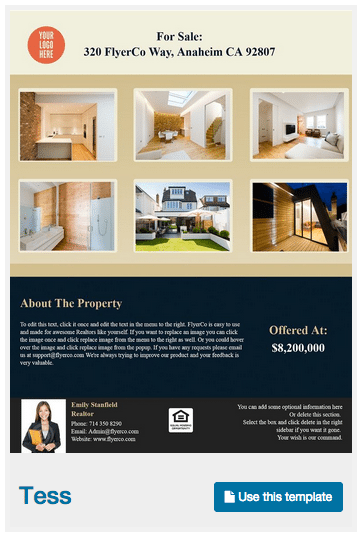 There isn’t anything complicated here, just really engaging design software for real estate marketing. Admin teams and even the most seasoned agent can have fun creating the materials that sell their homes. And I was told by management that there’s a lot more on the way for FlyerCo. 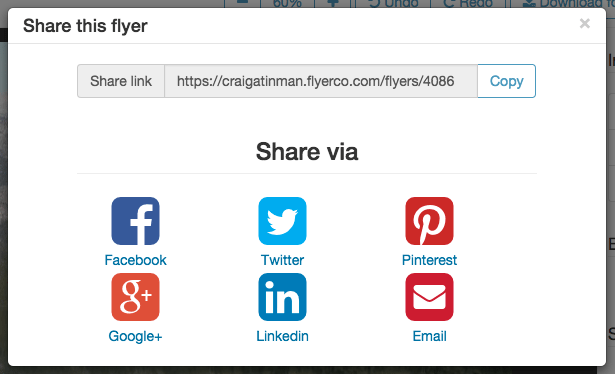 FlyerCo is the Canva for listing fliers: good-looking, easy to use and shareable. Do you use FlyerCo? What do you think? Leave a comment and let us know!